In 2006, race directors added a half marathon to the mix, taking advantage of the fun, festive atmosphere of the full marathon and offering runners the most scenic parts of the course, but at only half the distance. The marathon weekend also includes a Quality of Life Expo, Bike Tour, Select Health Kids Marathon and a 5K. The race has only grown in popularity since then, as more than 4,000 runners crossed the finish line in all three running events each year, including more than 3,000 runners in the half marathon alone. 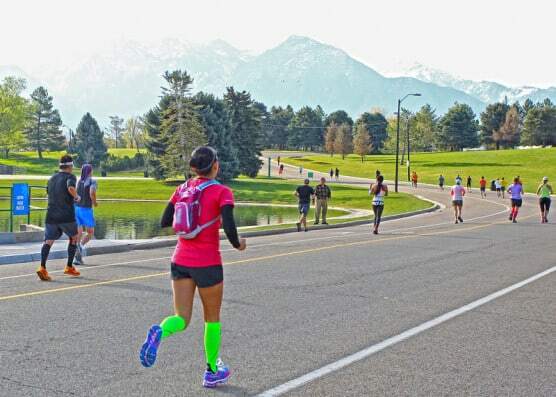 Both the marathon and the half are point-to-point, USATF-certified courses that take runners through the heart of Salt Lake City, offering beautiful views of the surrounding snow-capped Wasatch mountains. Starting at an elevation of just over 4,800 feet, the half marathon course offers mostly flat and downhill running, with a net elevation loss of just under 600 feet. The half marathon and the full marathon are run simultaneously and share a common start line on the Olympic Legacy Bridge at the University of Utah, the site of the 2002 Winter Olympic Athlete Village. For the first several miles, both half and full marathon runners are together, as the course heads into the city, winding through Salt Lake’s legendary wide streets and passing by picturesque neighborhoods and elegant estates. At the 9-mile mark, the half marathon course splits from the full marathon around Westminster College. The course then continues west, taking several turns, until runners reach 500 East. From here, the route heads north through Liberty Park and then turns left to head toward State Street, which brings runners back up 200 East. Expect a lively, energetic last mile, as crowds of cheering spectators and live bands line the course all the way to the finish line at Washington Square. Nestled along the southern shoreline of the Great Salt Lake in central northern Utah, Salt Lake City typically sees cool to mild weather in April, a month that has seen record temperatures here as low as 26 degrees (in 1991) and as high as 86 degrees (in 2000). On race day (April 13), the average low is 43ºF and the average high is 62ºF. See the race route map for the Salt Lake City Half Marathon here. 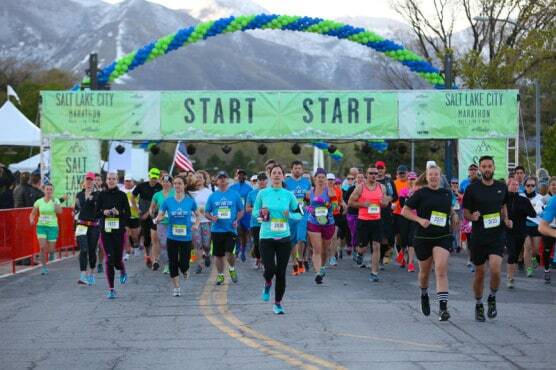 To reserve your spot in the 2019 running of the Salt Lake City Marathon, Half Marathon, 5K or bike tour race, register online at ChronoTrack.com here. 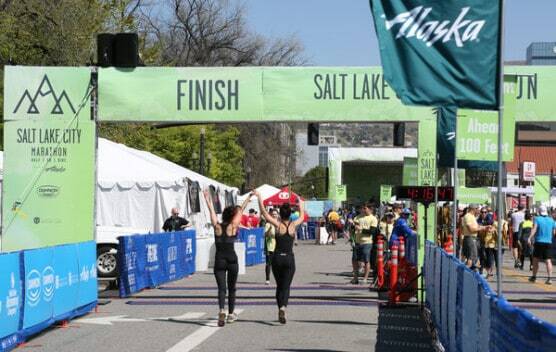 Ever run in the Salt Lake City Half Marathon? Share your impressions here, or post your review in the Comments below. I was looking at some local Marathon information & saw your post. I am on the Salt Lake City Marathon committee. I am chair of the packet/ goody bag put-together and the bib/packet pickup. On Marathon week, we fill packet bags on Thursday and distribute them on Friday. If this event would help your students earn volunteer hours, we certainly welcome them. These two projects fill the day but volunteers can sign up for shifts. Hence, they could participate all day or 4-6 hours. We’re quite flexible. They would receive a Salt Lake City Marathon shirt and a goody bag plus snacks during their shift. Please let me know if you are interested. Our first meeting for the 2018 is next Wednesday and I would love to tell the committee members that I have a head start for volunteers! And, your students would have bragging rights for their service and it’s “work” but the comraderie and atmosphere make it more like a party! I have a group of high school students who need to earn volunteer hours. They may not be able to volunteer on race day. Do you have marathon preparations that you need volunteers for the week of the race? Such as, putting together packets? If not, do you have any other events in the Salt Lake or Ogden areas that you need volunteers for before May 1?